Deborah’s on the radio getting ready for tonight’s Gallery at the Poughkeepsie Grand Hotel and the launch to her book tour!!!! Listen to Joe Daily and Michelle Taylor on Q92 from 8:00am – 9:00am when Deborah joins them to take your calls at 845-471-9292! www.q92hv.com! 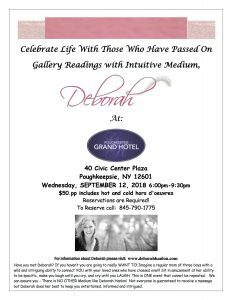 Celebrate the life with those who have passed on featuring Intuitive Medium Deborah Hanlon as she connects through energy to our loved ones and friends who have passed away. $50.00 for a cocktail hour and cash bar followed by a night with Deborah Hanlon. Reservations are required, call 845-790-1775.